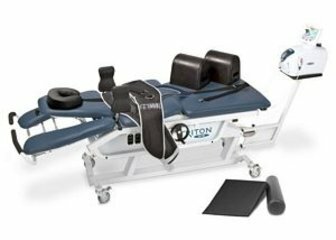 What is Spinal Decompression Therapy System (DTS)? 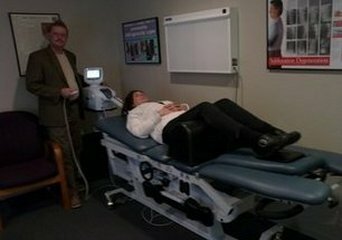 Decompression Therapy System (DTS) is a non-surgical treatment to help the management of serious low back/leg or neck/arm pain. DTS treatment is directed at relieving pressure on structures that may be a major source of pain. It can relieve the pain associated with bulging, protruding and herniated disc, degenerative discs, facet syndrome, spinal canal stenosis, sciatica and headaches. Can Decompression Therapy System (DTS) work for you? DTS helps relieve pain through decompression of the lumbar and cervical discs and joints (that is unloading due to distraction and positioning). This cyclical, painless stretching reduces pressure and promotes blood and fluid flow. This helps improve healing naturally. 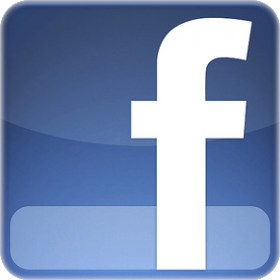 Twenty-five years of research combing efforts of doctors and therapists has led to the development of this technology. The DTS is not only a technically advanced device - but a safe and cost effective alternative to invasive treatments such as spinal surgery! Much of the common cause of back and neck pain is mechanical compression. Decompression is a direct, intuitive treatment - unlike other treatments/therapies it focus's its effort at the source of the pain and or your symptoms. 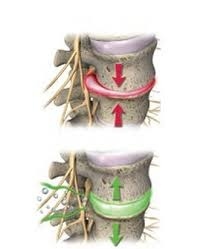 Damaged discs can cause limb pain or simply "refer" pain or they can pressure a nearby nerve root. True "pinched nerves" may create leg or arm pain but little low back or neck pain! They are often a more serious problem and may take additional time and decompression therapy to resolve. Patients are given a thorough exam and diagnosis as to suitability and prognosis. Some conditions and patients are not candidates. Treatments are done fully clothed. 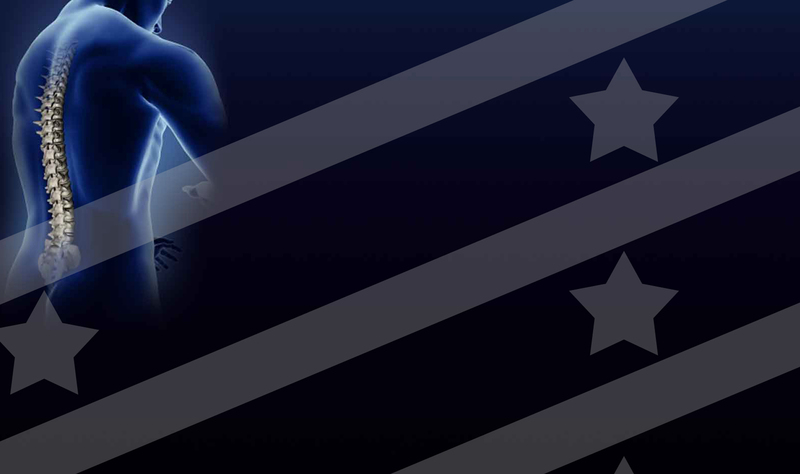 The treatments are inherently safe, well tolerated and without complications. Virtually all patients report DTS treatments are painless and often relaxing. In fact, unlike other methods the DTS is designed around patient comfort. 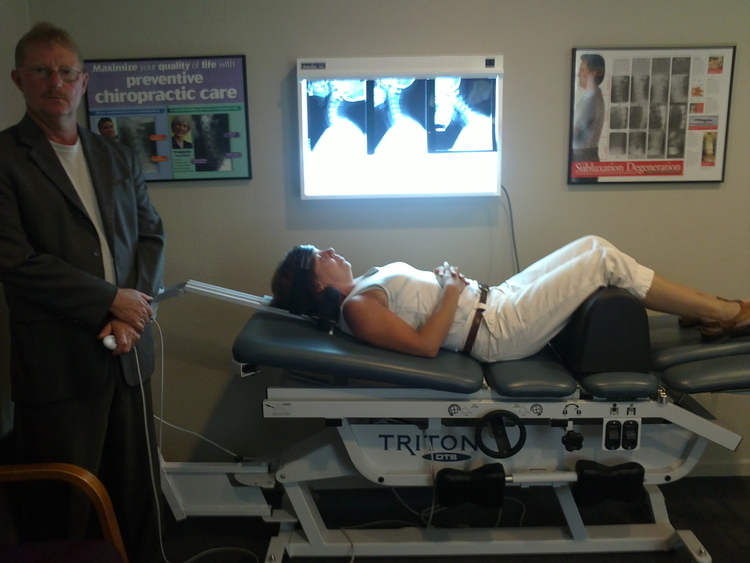 If you are experiencing neck, back or radiating pain you should seriously consider DTS treatments. Benefits from Cox Flexion/Distraction Spinal Decompression Therapy. Pulling, separating, or distracting the vertebrae in your spine increases the inter-vertebral disc height or spacing to remove pressure on the spinal nerves and disc by making more and improving circulation. 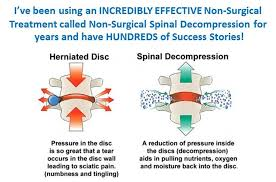 Reduces or drops the internal pressure with in herniated, bulging, and degenerative disc disease releasing pressure pressure on your spinal nerve roots. Increases the opening or area of the inter-vertebral nerve canal (canal or foramianl stenosis) up to 28% removing pressure on your spinal nerves. Restores motion to the inter-vertebral joints (facet joints)to allow normal physiological relationships of motion (realigns your spine).